We enjoyed our holiday at the Royal Azur very much and plan to return next year. There are three hotels on the complex and all facilities are accessible to guests. The hotel's beach is idyllic. I am prone to suffering with stomach upsets while on holiday. The Royal Azur is the only hotel I have stayed in where this has not happened. I took a couple of packets of Immodium with me and very happily packed them again to bring home unopened!! The breakfast and dinner are buffet stype and seemed to cater for all tastes. One evening we even had steak and kidney pie. There is also a beach snack bar which was reasonably priced serving food and drinks during the day. The hotel staff were very approachable and friendly. I cannot fault them. The only down side is the entertainment or lack of it. The singer beside the pool became a little bit predictable. We stayed at the Royal Azur Hotel, Hammamet. On arrival we were given a welcome drink which was appreciated and refreshing. When room was allocated our luggage was taken to the room and collected on departure. The staff were very friendly and helpful, they were all very smart and approachable. The room had an amazing view of the beach and the sea and was very clean and spacious. The maid was attentive and even brought us a hand picked bunch of flowers for the room. We were given a complimentary bowl of fruit, the mini bar was well stocked although we found it cheaper to go across the road to the supermarket. 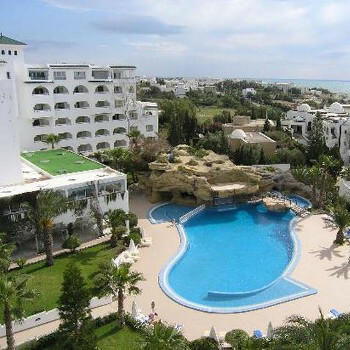 Hammamet town is within easy walking distance, however taxi`s are always waiting outside the hotel. We went exploring and found it no problem using public transport the places we visited cost a fraction of what it would have been going on excursions. Night life at the Royal Azur was limited but the Bel Azur provided nightly entertainment which was good. While out and about you do get hassled to go into shops and restaurants but a consistent no thank you they soon get the message. Beware of men approaching you claiming to work at your Hotel as a Chef, waiter, gardener etc they ask you to come and meet their family who are making carpets, shoes. They take you to a shop and you feel pressured into buying the goods. Best thing is not to go or tell them you have no money and your credit card is in England. Beware of the fake jewellery they claim to be 18carat gold it will make your skin turn green even though it has been stamped. When bartering stick to the price you really want to pay eventually you will get it at that price. I have stayed at the Royal Azure three times in the last twelve months. The hotel is a 5 star hotel. I found all the staff very friendly and the service excellent. There is not much to do in an evening, the two singers in the Pub bar try hard and it is quite sweet. I had a bad experience with one of the young bar staff who thinks that he can take money and goods from lonely single women guest. I will be going to the Royal Azure again as it is the best holiday location I have had. We visited this hotel as a last minute deal. when you first arrive it looks magnificent and from its facilities alone it does earn its 5 star rating. however, as pointed out below the (half board) food is not what you would expect from a 5* hotel (we only stayed 5 nights including New Year's eve). The Azur is multi national so if you wish to have an english speaking environment, you may struggle here, so I dusted down my school girl french and managed to make myself understood. I think its position is Ok however, the Yasmine area of Hammamet is new and has been designed to meet tourists needs. Hotel is dated but kept clean. Food was better than we expected but not 5 star, restaurant was very good though. People were well dressed and service was good. We kept in the hotel so don't know much about out and about. Staff were very good bar manager a bit miserable, but pool waiter very good. If you want a relaxing break lovely beach you should enjoy this hotel. We had a mixed holiday spent at The Royal Azur Hotel. We came to Tunisia last year and had a wonderful time at the resort of Port El Kantoui and we were looking forward to trying a different resort. We were disappointed that our bedroom was not ready for us on our arrival. Once into the room,the room we had was ok, nothing special and fairly worn out-it had seen better days. The mini fridge didn't work, the balcony light was broken, a plug socket wasn't working and the room was very dark. The good points were that the safe was free to use in your room, there was plenty of cupboard space and the bathroom was modern. The maid service was average-nothing special I bought a bottle of bleach to get rid of those holiday drain smells. I was, however,impressed at how clean the hotel kept the beach area-full marks there. The hotel itself was kept clean and tidy. Another bonus about this hotel is that they give you free sun lounger mattresses and a free towel at the pool/beach every day. There were plenty of sunbeds-no need to get at 6am to get a sunbed! The hotel is further from the beach than you expect and there are a lot of steep steps to climb which some elderly people found difficult. The beach is very good-quite long and wide and the sea is warm. The food was hit and mix. After 2 weeks I was desperate to find something to eat,however,our waiter was great and offered to have the kitchen cook me something that I fancied. The breakfast offers omelette's/pancakes fried up for you-you have to queue. The rest is a buffet-salad, cold meats, cereals, fruit, yoghurt, cooked breakfast but no pork i.e bacon. The milk was UHT and I prefer fresh. The evening meal was buffet-the trouble was the temperature of the food - the cold things were not cold and the hot things were warm and worryingly there were flies buzzing around. Everything is in sauce/stew and there are no English dishes at all. The deserts were the best but those flies worried me. We both suffered upset stomaches as did other guests. The waiter service was very good but you felt this was helped by tipping. The staff were a mixed bunch for every nice and friendly one you got there was a grumpy ignorant one-tipping helped but a five star hotel should have good service as standard. We felt trapped in the hotel and we did not feel safe to leave the hotel-Hammamet is a local town with tourism, not a tourist centre, and I felt the locals stared and scowled at the tourist and the groups of young men intimidated us-no women anywhere. The was absolutely nothing to do at all-no friendly bars, no shops to browse around etc. If you looked in the few shops the shop keepers pounced on you and you couldn't even ask the price of something because they hounded you and wanted to secure the sale-this wasn't hassle it was intimidation. We did brave the market at Nebeul-I love markets-but not this one. There were many stalls/shops but all sold the same things and it was mainly tat. The atmosphere was Tunisian i.e haggling and intimidation. We had difficulty getting a taxi back-it was so busy. We also went to Carthage-I saw 5 sites there, then to Side Bou Said and Tunis to the Bardo museum-we hired our own taxi and driver for the day so we could do what we wanted to do and not be herded on a bus. Our rep arranged it for us.This was an enjoyable day. There was limited entertainment at the hotel and nothing outside the hotel. From the moment we arrived we felt there was something missing at the Royal Azur and we were proved right. I read the reviews below the week before I travelled and I was looking forward to reaching the Hotel Azur. I have travelled all over the world and I have to say I'm not sure what the people belows' experience of in 5 star hotels but the Royal Azur is not one of them. (Possibly about 10 years ago). Do not go to the Azur if you have any taste - it's not good. There is a new complex over at the Jasmine resort area which is a complex being built and is built over the past several years, it's beautiful, on the beach, not expensive and the rooms and hotels are superb as is the food and the marina restaurants are great. I have visited Tunisia over 100 times as I love it so much! One of the nicest Hotels I have stayed in for all round satisfaction is The Royal Azur. Opening the taxi door to the wonderful smell of jasmin, you are greeted by the doorman into a wonderful open marble foyer with a beautiful hanging chandelier. I find it's nice to arrive about 10.00 p.m. when there a fewer people around and you can sit relaxed in the foyer sipping your standard lemon non alcoholic cocktail(although a little sweet for me). Reception staff a wonderful and will accommodate your request politely and with a smile. If you are unhappy with your room tell them and they will normally try to assist. The bungalows on the beach are the best and well worth paying that little bit extra for. Food is superb! Service superb! and entertainment Superb! The Royal Azur Hotel is lovely, set back from the main road in extensive gardens shared with the two other hotels on site the Bel and Sol. I think it is just the right distance from Hammamet town, a gentle 20 minute stroll either along the beach, beachside road, or down the main street passing all the little shops and workshops. The rooms are not sumptuous but very spacious and comfortable, with a separate toilet with bidet. We asked for a high floor and sea view, which is exactly what we got. The pleasant staff make for a very well run hotel. Pool (both inside and out), and beach towels are provided. The food is excellent, all freshly prepared on the grill while you wait or from the buffet. The drinks in the restaurant are not expensive. I do agree with the other reviewers that the entertainment is mostly non-existent which is precisely why my husband and I chose this hotel. If entertainment is important for you, it is available I believe at the other two hotels on site, the Bel Azur and Sol Azur.